In 4. and in 10. erroneously the word "premises" was used. It ought to be read "conclusion." The idea about an argument is that using true premises, a logical plea is made, to arrive at conclusions. If you assume the premises to be untrue or false, then there is no valid argument you can present. "Ad Hominem"covers a much wider range of false argumenting than just attackin the person of the opponent. "Ad Hominem" means "appleal to the man". It covers any argument that is not logically germane to the topic, but influences the argumenting opponent, maybe with attacking the person, but it could be cajouling him, showing hima personally favoured (but not logical) argument, etc. 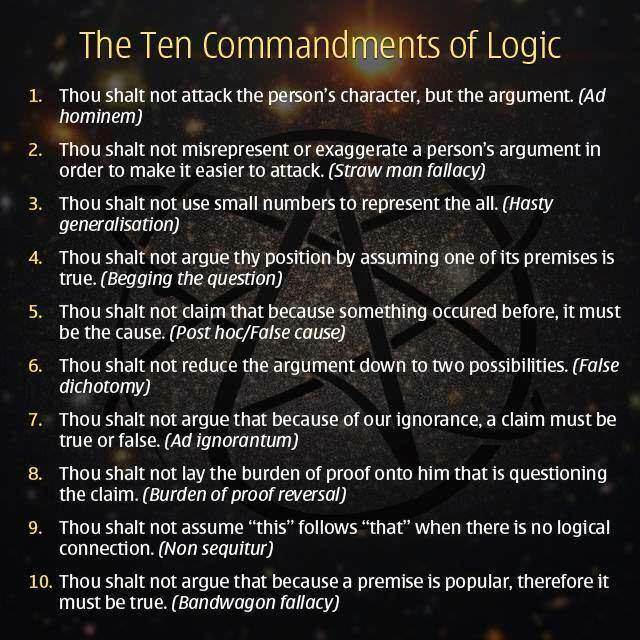 There are much more many "musts" or "commandments" to arguing, than these ten. Fallacious reasoning has many types, these are just a small and non-inclusive sample.